In the game of seduction, is the playing field really equal? After becoming the scandal of last season, Olivia Carlow reluctantly returns to London with her father. She's no longer married, she's not divorced and she's not a widow -- and Olivia knows her strange situation will leave her vulnerable to the unwanted and unsavory overtures of London's single (and not-so single) men. When the letter from Roland DeVere arrives, Olivia uses it to her advantage. Roland DeVere enjoys the carefree life of a second son -- perhaps a bit too much. After another night of revels, he wakes up to find that he has proposed marriage to Olivia Carlow and that she intends to hold him up to it for the time being. It is blackmail, pure and simple. And Roland DeVere, a man used to making his own decisions and forging his own path, suddenly finds the tables turned on him: his whole life and future hangs on the balance and one woman's yes or no will mean a world of difference for this rogue. Ripe for Seduction is the third book in Isobel Carr's The League of Second Sons series and was published last December 2012 -- one year and a few months after the second book came out. If I remember correctly, the first two books have more action/adventure/danger but this book shifts gears completely: the tension in the story is very subtle and, for the most part of the book, we are reading about the courtship of Roland and Olivia and of Margo, Roland's sister and Olivia's father, the Earl of Arlington. The juxtaposition between the two couples is very interesting and it was what propelled me to finish reading this novel. Olivia and Margo both have scandal attached to their names -- but that is where the similarity ends: Margo revels in her notoriety and enjoys flaunting it in the face of society. Olivia never wanted the infamy and she would want nothing better than to hide away in the country, hoping the scandal would just disappear. But the two women are connected through Roland and, in each other, they learn about how to manage their circumstances. ..."Where did you go after ..." Her voice trailed off as though she suddenly realized there was no polite way to phrase it. "After I found out I was no longer married? I went to my maternal grandmother, Lady Heddington. Where I stayed until she and father decided it was time to force me back into the world." "I'm sure they meant it for the best," the comtesse said softly. Livy resisted the urge to snap at her. "Undoubtedly, but I would still rather they had let me be." "For how long? Another year? Five? How long would have been enough?" The comtesse folded her letter and tucked it between her skirt and the leather seat. "No matter when you returned, the scandal would have been dredged up. Best to get it out of the way before it became the only thing anyone remembered about you." Margo and Olivia are both weary of marriages, for good reason. Margo saw the Earl of Arlington as nothing more than a fling and Olivia just wanted Roland as a buffer against the Ton -- it was unexpected for both heroines to discover such stability and sense of security in our two heroes -- but is it enough? Margo stopped him with two fingers pressed to his lips. Her dark eyes glittered in the candlelight. "You really don't want to marry me," she said. I was a horrible wife." Philip kissed her fingers and removed her hand from his mouth. "I don't believe you." He tugged her closer. "Of course you don't," Margo said with a sad shake of her head. "Which is why I can't marry you." "Afraid you'll disappoint me?" he said bluntly. "That I'll bore you? That we'll both regret marrying in haste?" "All of that and more, you lovely, deluded man. I'm fickle, inconstant --"
She made an inarticulate sound of annoyance, her brows pinching into a frown. "At the moment? Yes." Her hands smacked down on the bed. "But who's to say I'll still do so in a month?" The paradigm shift isn't one-sided -- Philip, the Earl of Arlington and Roland also experience a conversion. And this is part of this story's charm: as the story develops, so does the relationship of our two couples. This was a wonderful, well-written romance. Isobel Carr handled the shifting perspectives nicely and I was able to follow each story without any confusion. I wonder about the thematic direction this third installation is taking the series as a whole. The whole premise of the League was that they were the men behind the scenes, the men ran the world. In the first two books, there was a clear villain and a suspicious plot to uncover. In comparison to the first two books, Ripe for Seduction has a slower pace and did have a little bit of a villain towards the end of the story but the central focus of the book was the courtship. In this novel, Isobel Carr makes a statement that not everyone's love story requires an adventure. Sometimes, the love story is the adventure. Running has always served Caro Frazier well. It worked when her parents disapproved of her chosen groom, when her husband took umbrage at his young wife's social success, and when circumstances forced her to flee London altogether. But when her past comes back to haunt her -- in the delicious form of Marcus Reeves -- running is the last thing on Caro's mind. Based on the summary, the next book looks like it will be another "battle of the sexes" story, much like Ripe for Seduction was. My small worry aside, I am looking forward to reading Marcus's story. Ripe for Seduction is the third book in Isobel Carr's The League of Second Sons series. To find out more about Isobel Carr and her books, visit her website. She's also on Facebook and on Goodreads. 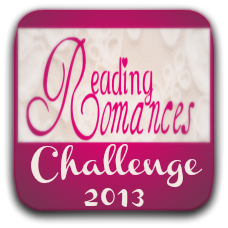 I read this for the Reading Romances Challenge for March.